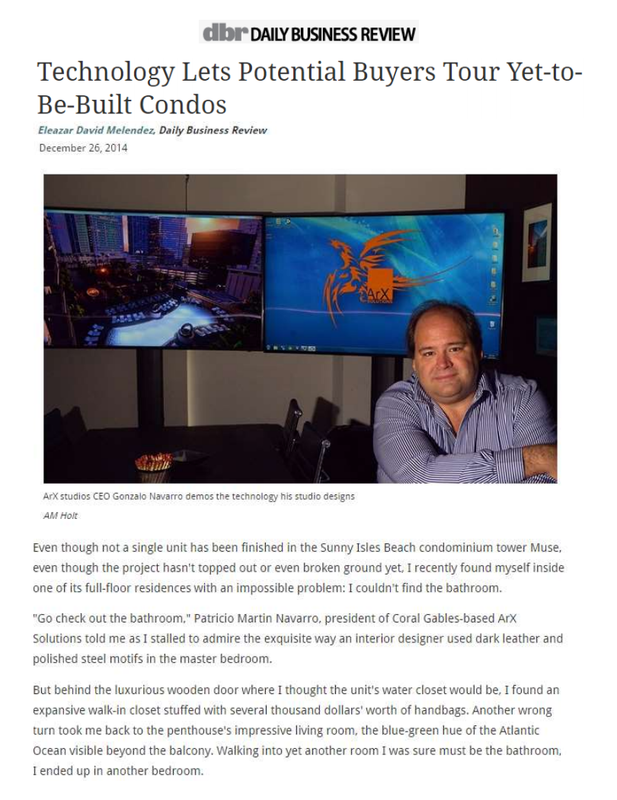 Even though not a single unit has been finished in the Sunny Isles Beach condominium tower Muse, even though the project hasn’t topped out or even broken ground yet, I recently found myself inside one of its full-floor residences with an impossible problem: I couldn’t find the bathroom. “Go check out the bathroom,” Patricio Martin Navarro, president of Coral Gables-based ArX Solutions told me as I stalled to admire the exquisite way an interior designer used dark leather and polished steel motifs in the master bedroom. But behind the luxurious wooden door where I thought the unit’s water closet would be, I found an expansive walk-in closet stuffed with several thousand dollars’ worth of handbags. Another wrong turn took me back to the penthouse’s impressive living room, the blue-green hue of the Atlantic Ocean visible beyond the balcony. Walking into yet another room I was sure must be the bathroom, I ended up in another bedroom. Having someone get lost in an apartment that doesn’t even exist is a coup for Navarro and the technology he’s pushing, which the executive confidently predicts will soon be standard in every condo sales center in South Florida. Navarro has spent over 25 years creating 3-D renderings for personal projects and clients, establishing his company as a go-to firm for architectural mockups of planned residential projects. He claims over half of all published 3-D renderings for South Florida projects in the last cycle were made by his team of digital designers. Having people walk into a sales center, pop on a headset and take an electronic tour of an unbuilt condo unit hasn’t been commercially viable yet because of software limitations, Navarro explained. One of the most obvious is a bug in the prototype I tested. After a few minutes of trying to find the Muse bathroom, I took a few seconds finding a real toilet: the Oculus Rift headset refreshes images at a rate slower than what the human brain is accustomed to processing, which causes motion sickness on nearly all inexperienced users. Scientists who study virtual reality have lovingly dubbed this phenomenom the “barfogenic zone” problem. Navarro seems to take pleasure in explaining all the issues what he and his team will have to get over to make the technology viable. He explains the software he’s using to code real-time visualizations is not really meant for architectural illustrations. ArX relies on the same code that video game makers use to produce games like Mortal Kombat, Tony Hawk’s Pro Skater and popular shoot-em-up Far Cry. While that allows him to “free ride” off of someone else’s hard-earned development work, it also causes issues that he never faced doing 3-D still renderings. A simple example: a mirror’s reflection as you move side to side is something some virtual reality engines don’t do very well. Other gaming-focused platforms do mirrors perfectly but can’t properly render the look of polished marble or velvet. Giving clients an immersive view of their yet-to-be-built condo unit as a way of sealing a multimillion-dollar sale appears to be very much in vogue as it relates to high-end residential offerings in South Florida. Both the Thousand Museum project in downtown Miami and the Ritz-Carlton Residences in Miami Beach have sales centers that make use of holograms to show potential buyers what their units could look like inside out. Krystal Tower, a newer preconstruction project in Overtown, utilizes a bare-bones virtual reality setup that allows potential buyers to walk through their unit and get some general sense of what their view would be like. At the Palazzo del Sol sales center in the exclusive Miami Beach enclave of Fisher Island, a gigantic horizontal touchscreen set in the middle of a monitor-covered room allows potential buyers in that condo project to see 360-degree vistas of what views would be like from their future balconies. The touchscreen runs a powerful app that allows residential brokers to visually provide clients with project information in an engaging way. During a recent visit with the Daily Business Review, sales director Dora Puig demonstrated how with a few touches, flicks and taps on the “magic table,” she could put the view from a future condo up on one set of screens, detailed renderings on another, and a map of amenities on Fisher Island on yet another. All throughout, the muted sound of rolling waves pleasantly played in the background. “People are floored,” Puig said. A challenge is making sure people doing tours of the sales center don’t put drinks on the touchscreen table. Navarro acknowledges his vision has competition from other high-tech offerings but said he believes real time will end up being the standard. Navarro predicts the technology itself could end up as the proverbial tail wagging the dog, changing the way brokers think about showing pre-construction units, and not just how they do it.